A Northern Saw-whet Owl peering out of its hut. If you have been to the owl banding on a busy night, you may have seen us placing Saw-whets or Boreals into one of the huts that we place them in to await their turn for banding. Every once in a while one will break out. 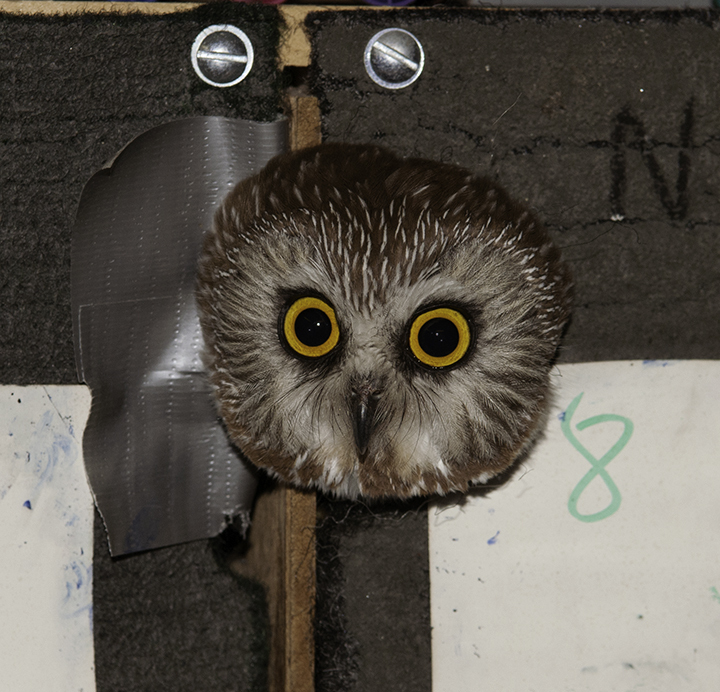 The Saw-whet in the top photo, instead just poked its head out and watched us as we banded. How can you not love Saw-whets?Its hard to believe that the season is starting to near the end, especially since the nights have continued to be productive. Since our last post we have banded another 181 Northern Saw-whets, 79 Long-eards and one Barred. 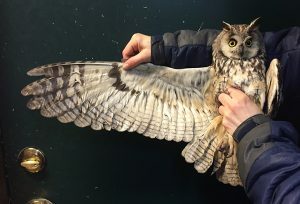 The season total now stands at 1,144 owls banded; 746 Saw-whets, three Boreals, 389 Long-eareds, 5 Barreds and one Great Horned. We also recaptured 13 more previously banded owls. Included in these were a Long-eared we banded as a young bird in the spring of 2010 and two Saw-whets we banded on April 20 last spring. This brings the season’s recaptures up to 37 Saw-whets, four Long-eareds and one Barred. It has been great to see the Saw-whet numbers bounce back after three spring seasons with unexpectedly low totals. It’s been absolutely crazy to experience another North American record season for Long-eareds. While our Saw-whet total is a couple hundred short of the record season at WPBO, the combination of the rebounding Saw-whets and the record Long-eareds has us rapidly closing in on the overall record season at WPBO. Hopefully nights will continue to be productive. A beautiful male Long-eared Owl.